Why taxpayers remain on the hook for sports subsidies. (b) Doing any work that does not involve mouthing lobbyist-penned talking points in exchange for campaign contributions. A few weeks ago, Sen. Tom Coburn (R-OK) introduced legislation that would revoke the tax-exempt status of the National Football League, the National Hockey League, the Professional Golfers' Association Tour and other sports leagues currently considered nonprofits by the Internal Revenue Service. (And yes, you read that correctly: in the eyes of America's tax code, the NFL and the Red Cross are largely the same. More on that in a bit.) Dubbed the "PRO Sports Act" -- PRO being an acronym for Properly Reducing Over-exemptions -- Coburn's proposed law would save the federal government nearly $100 million annually, enough to cover sequester-related cuts to national parks and military base schools. It would allow Republicans to brag about closing unpopular loopholes and Democrats to boast about preserving popular services. Most importantly, it would strike a tangible blow against Sports Welfare -- the billions of dollars in local, state and federal subsidies for the private sports industry. This is money pick-pocketed from taxpayers year after year, an astonishingly inappropriate, maddeningly unnecessary payout that feathers the overstuffed, already-profitable nests of entities like the NFL and individuals such as Miami Marlins owner Jeffrey Loria, adding to the nation's maxed-out charge card bill all the while. Naturally, Coburn's proposal has no chance of becoming law. Or coming up for a vote. Or even being publicly debated by Congress. For now, at least, it's politically stillborn. "Try to go after corporate welfare," says a frustrated Capitol Hill staffer. "No one wants to do it. Nobody will pull the trigger. They won't put their name on anything specific. It all comes down to money. [Lawmakers] are all beholden to various people who raise money for them. Or their lobbyists. Who even knows?" The awful truth about Sports Welfare? Like cockroaches and John McClane, it dies hard. Even when politicians and voters try to kill it. A few weeks ago, Florida lawmakers declined to vote on a bill that would have cleared the way for nearly $400 million of public financing for renovations to the Miami Dolphins' Sun Life Stadium. Given that the state's taxpayers will ultimately spend an estimated $2.5 billion paying off the Marlins' new ballpark -- an epochal municipal heist that contributed to former Miami mayor Carlos Alvarez suffering the worst recall defeat in the history of American elections -- the bill's death was predictable. It also was highly unusual. Just this year, the Minnesota Vikings have ransomed lobbied their way into $498 million of public funding for a new stadium that looks like a "Star Wars" Sandcrawler, sans Jawas. The Sacramento Kings have pulled the same trick in their home (for now) city, fleecing taxpayers out of as much as $334 million. Chicago mayor Rahm Emanuel has announced that his cash-strapped city will contribute roughly $100 million toward a new DePaul University basketball arena that's located just 50 blocks from the school's campus. (Also: DePaul?) The NFL has demanded that Super Bowl bid cities exempt its employees from a broad range of state and local taxes … oh, and throw in free parking to boot. An ESPN investigation of 115 athlete-founded charities discovered that many are ineffective, unethical or both, converting otherwise taxable sports star income into things like Lamar Odom's cancer charity -- which reportedly funded two Amateur Athletic Union basketball teams and paid Odom's high school coach and best man $72,000 a year, but never gave a penny to actual cancer-related causes. Sports Welfare is not a one-off summer blockbuster. It's an all-encompassing franchise, complete with sequels (the Atlanta Falcons getting $554 million to replace the 20-year-old Georgia Dome), spin-offs (the Philadelphia Eagles gearing up to ask for public money to upgrade 10-year-old Lincoln Financial Field) and reboots (the new "College Football Playoff" being just as tax-exempt as the old BCS Championship). And this, in turn begs a question -- an incredulous one, the same question posed by McClane in "Die Hard II." How can the same s--- happen to the same guy twice? The NFL's non-profit status -- and Coburn's dead-in-the-water effort to nix it -- is illustrative. The league, its teams and various subsidiaries earn roughly $9 billion in revenue per season. They will collect a guaranteed $27 billion in television money over the next decade. They exist to make money. They are very, very good at their jobs. Under federal law, however, the league office is classified as a tax-exempt 501(c)6 organization - essentially, a nonprofit business league -- just like your local chamber of commerce. "I was flabbergasted when I learned that," says Mario Hankerson, a former Baltimore Ravens player who now works as an attorney and technology consultant. "I thought it was a joke. When I was a player, I had no idea." According to the IRS, 501(c)6 organizations must be "associations of persons having some common business interest, the purpose of which is to promote such common interest and not to engage in a regular business of a kind ordinarily carried on for profit." (Italics added). In addition, Coburn says, business that conduct operations for profit on a "cooperative basis" do not qualify. Yet somehow, the NHL, PGA Tour, Ladies Professional Golf Association and even Major League Lacrosse do. So does the NFL, which is a 501(c)6 thanks to specific language covering "professional football," quietly tucked into an unrelated 1966 Congressional bill covering investment credits and property depreciation. How much does this loophole cost taxpayers? Due to accounting vagaries, no one knows for sure. 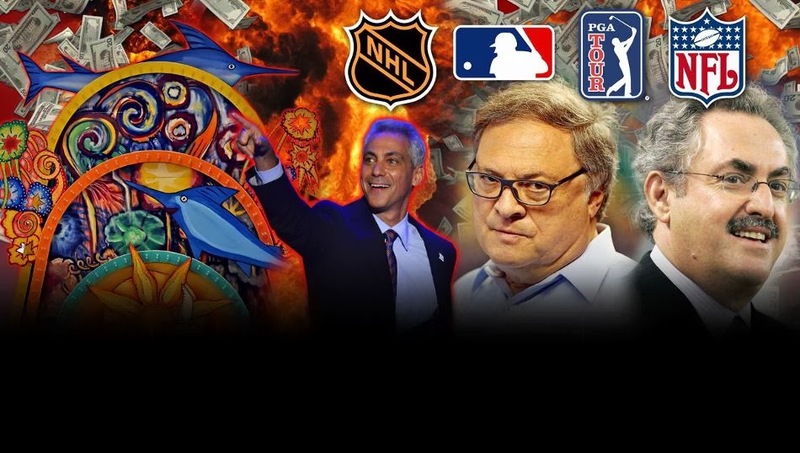 Given that the standard corporate tax rate is 35 percent -- and that the NFL and NHL collectively received about $260 million in membership dues from their teams in 2010 -- Coburn estimates that sports leagues are sheltering at least $91 million annually. But the actual amount is likely higher. After all, the PGA Tour and LPGA had combined gross receipts of more than $1 billion in 2010. A 2010 law review article by Vermont-based attorney Andrew Delaney notes that individual pro teams also can write off their league membership dues -- a bit of what Delaney calls "creative asset priority reallocation" (read: perfectly legal money laundering) that amounts to an estimated $5 million-plus annual deduction for NFL clubs. "As a lawyer, I have a certain admiration for what the NFL is doing," Delaney says. "It's smart. They're basically taking something legal and using it in a way that it probably shouldn't be used. Taxpayers are paying for it. That's not a good thing. "It would be like if we took a company like [General Electric] and said, 'Hey, since you employ all these people and your corporate profits are only several hundred billion dollars a year, here's an extra $500 billion bonus because we just like you guys.'" But wait. There's more. As Delaney's article notes, the NFL's non-profit status subsidizes the astronomical salaries of executives like commissioner Roger Goodell ($11.6 million in 2010), media vice president Steve Bornstein ($12.2 million) and former commissioner Paul Tagliabue ($8.5 million). It also allowed the league in 2009 to pay 296 salaries over $100,000; fork over $7 million-plus for legal fees; spend nearly $1 million a month for office space; shell out $6.25 million for "travel services"; and pay 135 total independent contractors at least $100,000 apiece. More infuriating still -- or clever, depending on your perspective -- is what the NFL does with the rest of its tax-deductible (by teams), tax-exempt (for the league) cash. According to Delaney, much of it goes to fund the NFL's stadium construction financing program, which provides team owners with ultra-low interest loans. To obtain said loans, owners are required to secure public stadium funding; to pay back said loans, Delaney explains, personal seat licenses are sold tax-free through public agencies. All in all, it's a pretty good deal for NFL owners. And a pretty good deal for the league, too, which essentially uses Sports Welfare to fund … more Sports Welfare. "It's kind of like ethanol," Delaney says. "I don't know why society is paying the NFL to make money." Coburn's legislation would tighten the spigot, both by prohibiting sports leagues in general from qualifying as 501(c)6 organizations and by amending the 1966 law that benefits professional football. Problem is, the bill can't find a co-sponsor. The Senate won't bring it to the floor. Lawmakers don't want to vote for it -- not when the NFL's political action committee and its owners, players and employees donated more than $2 million to Republicans and Democrats alike in 2012. The same lawmakers don't want to be seen voting against it, either. Not when corporate welfare is deeply unpopular. And so it languishes, adrift in political limbo. "You hate to embarrass people, but that's what it takes with something like this," says a Capitol Hill staffer. "If [Congressional members] were pushed on this publicly, they couldn't side with rich lobbyists or their special interest buddies in the NFL who give them free tickets." None of this is new. The history of legislative Sports Welfare reform is akin to the history of the electric car, a string of well-intentioned failures. In 2008, former Rep. Dennis Kucinich (D-OH) held a series of hearings about public stadium financing. He claimed his probe into the construction of new Yankee Stadium uncovered "substantial evidence of improprieties and possible fraud." Nothing came of it. In 1999, former Sen. Arlen Specter (R-PA) co-sponsored with former Sen. Joe Biden (D-DE) a bill that would have required MLB and the NFL to pay up to 50 percent of construction costs for new stadiums. Not the entire cost. Not even two-thirds. Just half. Nothing came of that, either. Thirteen years earlier, former Sen. Pat Moynihan (D-NY) tried to close a loophole for federal tax-exempt private revenue bonds being used for stadium construction. He succeeded. Professional teams promptly began convincing municipalities to finance their stadiums with tax-exempt general purpose bonds, which stiffed the federal government and shifted more of the cost burden onto the public -- prompting former Sen. Byron Dorgan (R-ND) to quip: "It looks to me like the only healthy public housing program in America today is the one that builds sports stadiums with luxury skyboxes with public funds to house professional sports teams with private ownership." In 1996, Moynihan introduced a bill to eliminate the second loophole. It fizzled, leaving America stuck with the bill. According to a must-read Bloomberg report, the loophole currently costs the U.S. Treasury $146 million a year -- about the annual cost of the federally funded Supplemental Nutrition Program for Women, Infants and Children in the state of Pennsylvania -- while the $17 billion of tax-exempt stadium debt issued since 1986 will cost American taxpayers a total of $4 billion through 2047. "People say the problem is greed," says Arthur Rolnick, a University of Minnesota economist and former vice president of the Minneapolis Federal Reserve. "Well, we've always had greed. Greed is not what is going on here. It's bad policy." Why do cities and states cough up Sports Welfare in the first place? Typically, it's for the same reason they provide an estimated $90 billion in annual subsidies and tax break to companies like Microsoft and General Motors: Said companies threaten to move somewhere else, ginning up bidding wars between local politicians. Rolnick calls this phenomenon "the economic war among the states." He has studied it for decades. Observed it up close. In 1991, Minnesota-based Northwest Airlines lobbied local lawmakers for roughly $1 billion in subsidies; in exchange, the company promised to build a maintenance facility in the state. Rolnick crunched the numbers. The deal was a dud. The airline was in deep financial trouble. Its bonds were junk. Meanwhile, Minnesota was in a recession. It needed money for schools and roads. In newspaper editorials and on public radio, Rolnick advised against the plan. Why, he asked, should the state essentially bail out a private company? This doesn't make any sense. It's a poor investment. A prominent state politician pulled him aside. This is about Northwest's headquarters, the politician explained. If we don't do it for these guys, they'll leave. And we'll lose jobs. "What happens is that from a national economic perspective, you get a zero-sum game," Rolnick says. "Not a single job created. You're just moving them around. So these subsidies make no economic sense. But at a local level, they're very seductive. You're a mayor, a governor, you attract a business like this, you get a win. But if you think about it like a war, you're just winning a battle. Then the next state or city comes along and bids below you. "The sports teams are the best at playing this game by far. No pun intended. And my criticism isn't really against the CEOs or the owners of the teams. I would do the same if I was them. My criticism is of Congress. They can fix the rules of the game." In a 1995 article written for the Minneapolis Federal Reserve, Rolnick and co-author Melvin Burstein came up with an ingenious way to end the interstate economic giveaway race -- a 100 percent federal excise tax on all state and local subsidies designed to benefit individual corporations. Including sports teams. Again: Pretend you're an NFL owner. And pretend you wring $500 million out of local and state governments to build a new stadium. Under Rolnick and Burstein's plan, all of that money counts as income. Worse still, the IRS slaps you with a half-billion dollar tax bill. A single federal law. The end of most Sports Welfare as we know it. Just like that. "If you're the owner of the Vikings, why bother coming to the city or state for anything?" Rolnick explains. "You'll just have to turn it over to the federal government. Overnight, all of the bidding wars end. The [Cleveland] Browns never move to Baltimore. And the real beauty is that it's a tax you'll never have to collect. "It was a simple idea. And it scared the hell out of [sports owners]." Indeed. In 1999, then-Rep. David Minge (D-MN) introduced a bill that essentially would make the Rolnick-Burstein proposal law. It died in committee. The Senate held a follow-up hearing in 2007. Words did not produce action. Never mind that the European Union has similar, successful rules that prevent inter-country bidding wars. Never mind that the North American Free Trade Agreement has language prohibiting the United States and Canada from going after each other's businesses. As former baseball owner Bill Veeck once quipped: "Look, we play the Star-Spangled Banner before every game -- you want us to pay income taxes, too?" "The sports teams got it killed," Rolnick says. "I got to testify. But I was going against George W. Bush. How did he make his fortune? With his clout in Texas, he got the local government to build him a stadium. He wasn't going to turn against that." Rolnick argues that municipal and state corporate subsidy bidding wars violate the Commerce Clause. No one listens. Time and again, he has testified against public stadium funding, in Minnesota and across the country. He shows up alone. Maybe brings a few poor people who actually need government help. He presents cold, hard, academic facts: Numerous studies have shown that the local economic impact of stadium construction is nil. Teams bring dozens of lawyers and lobbyists. They wear nice suits. They bring fans, too, their faces painted in bright colors. They present warm, fuzzy fantasies: New stadiums are a boon! Jobs! Jobs! Jobs! After the public hearings, the lobbyists work the hallways and side rooms, whispering in private. Vote for this, and we'll support you in your next electoral campaign. Don't vote for this, and … well, that's a real nice legislative seat you have. It would be a real shame if something happened to it. "These guys are good," Rolnick says. "They're really good. And it's an old problem. Look at the subsidies that go to farmers. Looks at the billions they get. You have a small number of people with a huge potential gain going against a large number of people with a small potential individual loss. Who is going to fight harder? That's what were up against. "Say you invest a million dollars a year for 10 years, and at the end, there's a very good chance you'll get a billion dollars in subsidies. Why not hire a few lobbyists and be there in the state capital or with the city council, year after year? You have almost nothing to lose." And everything to gain. Minneapolis law requires a voter referendum for sports subsidies larger than $10 million. After intense lobbying, the state legislature granted the Vikings' new stadium an exemption. Shocker: Taxpayers already are facing a reported $33 million annual shortfall toward funding their share of the project. In 2006, Seattle voters passed a measure forbidding the city from financially supporting sports teams unless the investment yields a profit -- for taxpayers, not the team owner -- on par with the yields from 30-year U.S. Treasury bonds; as Seattle Times columnist Bruce Ramsey explains, prospective NBA owner Chris Hansen nearly landed the Kings by devising a clever way around the prohibition. Just last week, longtime Associated Press sports columnist Jim Litke blasted Dolphins owner Stephen Ross and the NFL for attempting to get taxpayers to "foot the bill" for Sun Life Stadium renovations. In a full-throated, yippie ki-yay defense of Sports Welfare, league spokesman Greg Aiello fired back, pooh-poohing Litke for both "ignoring the extraordinary amount of private financing that is going into NFL stadium projects" and incorrectly implying that Ross wanted the public to pay the entire bill. Sports Welfare persists because its beneficiaries are persistent. And persistently shameless. "I have some very close CEO colleagues," Rolnick says. "I cornered them and said, 'Look, guys, you're saying the Vikings stadium is important for your business to attract good talent to this area. So what about a corporate surtax to pay for it?' Oh, no no no. We can't do that." Rolnick sighs. He wishes Coburn luck. But he isn't optimistic. Back in the 1990s, he says, a national newspaper reporter told him that unless Congress decided to do something, he would be talking about this issue forever. "She was right," he says. "It's gaming the government. And it's déjà vu every time."